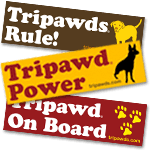 Help #HurricaneHarveyPets by ordering a custom pet tag from the Tripawds Etsy shop. 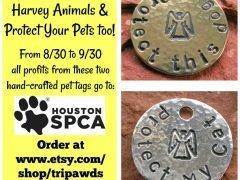 All profits between 8/30/17 and 9/30/17 will be donated to the Houston SPCA. 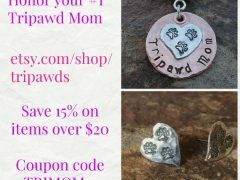 Honor special ladies for Mothers Day with a 15 percent discount on any custom Tripawd jewelry piece valued over $20 made just for people and pets. 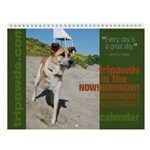 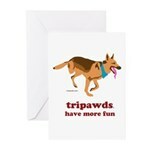 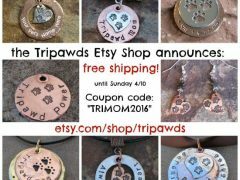 Save in the Tripawds Etsy Shop for all your custom three-legged dog and cat tags, human jewelry and more. 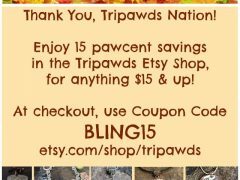 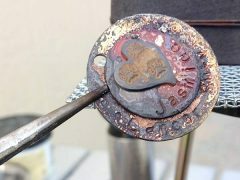 See how we use heat and solder in the Tripawds Etsy Shop to create a variety of custom Tripawd parent jewelry in silver, copper, brass and more!